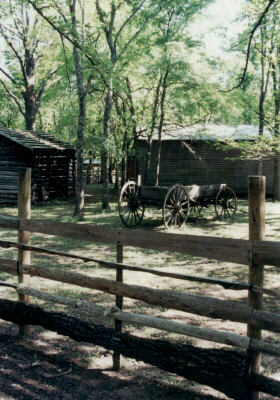 A self-guided tour of Adams Corner Rural Village is included in general admission to the Cherokee Heritage Center. Unfortunately, I did not have enough time on either visit to fully explore this piece of the CHC. And I did not take many inside pictures. In fact, I think things were already locked up by the time I got over to it in 2004. Most of the text on this page is courtesy of the CHC (cherokeeheritage.org) website. Adams Corner Rural Village "is a collection of seven buildings representing a typical rural Cherokee community and life in the 1890s before Oklahoma statehood. The replicated small settlement officially opened June 15, 1979. At first glance, 1890s community life appears to be tranquil to our modern eyes. Yet, the era was actually a turbulent time as had been several other threatening decades such as the 1830s with the Cherokee Trail of Tears, and the 1860s with the Civil War as experienced by the Cherokee Nation. In the 1890s, a financial depression hit the U.S. economy. The Cherokee Nation had worked hard to rebuild itself following the devastation of the Civil War. As a sovereign nation, the Cherokee government operated its own legislature, court system, jails, newspaper, an orphanage, and schools including seminaries of higher learning for both men and women. Cherokee Outlet is shown outlined in red on the 1885 map at left. The six-million-acre Cherokee Outlet was land owned by the Cherokee Nation (not to live on, but to use for hunting). The Outlet was unsettled land, and located just below Kansas where railroad tracks existed. Texas cattlemen found the grasslands of the Outlet ideal for fattening their cattle before loading the cattle onto trains in Kansas. Grazing leases provided needed funds to operate the Cherokee government. 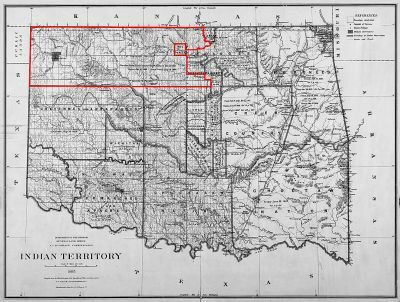 However, when the Unassigned Lands of Oklahoma Territory opened to pioneer settlement in 1889, the hunger for Indian Territory land by American citizens grew. The grazing leases were disallowed by the federal government, and the Cherokee Nation was forced to give up the Outlet, which was subsequently opened to pioneer settlement in an 1893 run for land. The Cherokee Nation, along with neighboring Native nations, found their autonomy and well-being threatened by the growth in numbers of non-Natives moving into Indian Territory. The Cherokee court system of a Supreme Court and nine district courts became threatened because so many incidents involved non-Native individuals, causing federal courts to intervene. The Dawes Commission, established by the U.S. Congress, began the task of allotting the lands in the Cherokee Nation (formerly held in common by Cherokee people) to individual Cherokee citizens (with the result that excess land was sold on an open market). The allotment process created the Dawes Roll, a formal list of Cherokee citizens (present-day Cherokee Nation citizens are descendants from the Dawes enrollees). The Dawes Commission resulted in the dissolution of the Cherokee government, Cherokee schools were handed over to the new state, and Cherokee courts were closed. One last hope was a constitutional convention held by the various Native nations of Indian Territory in an effort to create an American Indian-led state called Sequoyah. But, Indian Territory was made to join with Oklahoma Territory to form the State of Oklahoma. 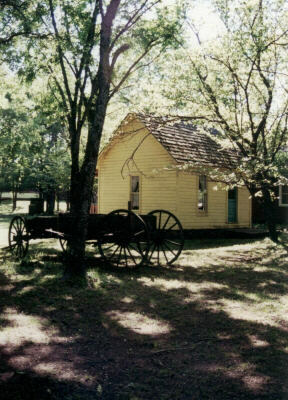 The events of the 1890s represent the turbulent era in which the buildings of the Cherokee Heritage Center’s Adams Corner Rural Village are set. While small rural villages might have seemed havens of bucolic peace, the minds of the residents of these villages were often agitated and concerned with issues affecting their future well-being. Some of the dismantling efforts undertaken by the federal government were later reversed (and there was a settlement providing added compensation from the forced sale of the Cherokee Outlet). The Cherokee Nation, along with other Native nations, have regained status as sovereign domestic nations. Still, the heartache and disruption of the Nineteenth Century leaves its legacy today as contemporary Cherokee citizens seek to explore and understand past events, ensure survival of the Cherokee language, vigilantly protect existing rights, and invigorate past and continuing arts and practices. Cherokee residents of territorial-era communities like Adams Corner lived out their lives focusing on family and friends, working at daily tasks, engaging in ceremonies, and enhancing their properties and skills, just as Cherokee people do in today’s challenging world." Green leaves show many of these pictures are from our April 2001 visit. "Several denominations sent missionaries to work among the Cherokees. The Moravians, Baptists, Methodists, and Presbyterians were among the first to devote their missionary efforts to Cherokee communities. The earliest missions included religious services as well as schooling for children. After moving to Indian Territory, the Cherokee Nation set aside one acre of ground for each church and another one or two acres for each cemetery. Congregants often got together to raise their church. Scriptures and hymns were published in the Cherokee language. 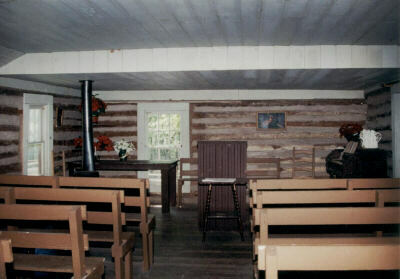 Hymn singing was a much enjoyed pastime, and the Cherokee language was heard lilting from various church windows. The most rural churches often had itinerant preachers with members of the congregation filling in on Sundays when the traveling preacher was scheduled to be at another small church on his route. Sunday services were generally longer than today’s and usually involved a picnic meal on the church grounds because travel by horse drawn wagon took more time than modern modes of travel (travel times also caused churches to be sprinkled throughout the territory to serve remote congregations). During revivals, a brush arbor might be built to accommodate the larger crowd, and members would bring bedding and camp on the grounds overnight. The New Hope church building in Adams Corner Rural Village was not originally a church . . . it was donated and moved to Adams Corner to represent an early church building." The interior shot is of the church. "The Cherokee Nation has long emphasized education as a tool for survival. During the 1800s, the literacy level of the Cherokee Nation was higher than Texas or Arkansas. Literacy was spurred by the use of Sequoyah’s syllabary, which enabled citizens to read the Cherokee Advocate newspaper and to keep abreast of the Nation’s issues and events. In 1841, the Cherokee Nation opened the first free compulsory co-educational public school in the United States. The first public school in Tahlequah opened in the spring of 1846 opposite the southeast corner of the public square. At the end of the 19th Century, there were 124 schools with 28 designated for full blood students, 15 for descendants of freed Cherokee slaves, and the rest were open to all students. A Female and Male Seminary for higher education was also supported by the Cherokee Nation. The Female Seminary was the first school for higher education for women west of the Mississippi River. After Oklahoma statehood, the state Department of Education granted 62 hours of college credit to the Seminary’s graduates. In small villages, the walk to school would be shorter than it would be for rural children, who might need to walk a couple of miles to school. Most schools lumped together in one room as many as eight grade levels. Students wanting a higher education had to enter boarding school, or stay with relatives in a larger community. The teacher in a one-room schoolhouse would be an unmarried woman, who would divide her teaching time among the different grade levels. For instance, some students would silently read or complete math problems while the teacher would work with another particular group of students in a corner of the same room. Students would study ciphering (math), penmanship, reading, and recitation (repeating memorized poems or essays before an audience). They would also study history, literature, spelling and science. Students would help the teacher by bringing in firewood, washing the chalkboard, or cleaning the felt erasers, banging them together outside the building causing chalk dust to fall off in a white cloud. Students who were unruly could be paddled by the teacher with a paddle board, placed in a corner with their back to the room, topped with a dunce hat (a pointy paper hat), or made to place their noses inside a chalk circle drawn on the chalkboard and standing there until the teacher excused them. A thoroughly uncooperative student would be expelled and sent home. At recess, games and toys could be enjoyed. Toys would be wooden spinning tops, ball & cup, jacks, or jump rope. Games might be tag, fox and geese, or drop the handkerchief. Another popular game was red rover in which two teams of an equal number of students faced each other with joined hands, a student would be dared to charge through the opposing team’s chain, and if failing, would be added to the capturing team, but if breaking through, would bring a member back for their team. The winning team was the one with the most members when recess ended. Fun fundraising activities would support the school. Cake walks (players pay to enter in hopes of winning a donated cake), pie suppers, and box lunch auctions (whereby unmarried young women would prepare a picnic lunch for two and compete to make the fanciest box to be auctioned to raise money) were popular. The buyer of the box lunch got to eat lunch with the maker of the lunch, so a girl with charm was often able to raise a good sum for the auction coffers." The mention of recitation in the paragraph right below the photo reminds me how important oratory skills were historically for Cherokees. Many decisions hinged on achieving a consensus, so most of what I have read indicates the ability to verbally sway an audience was paramount. 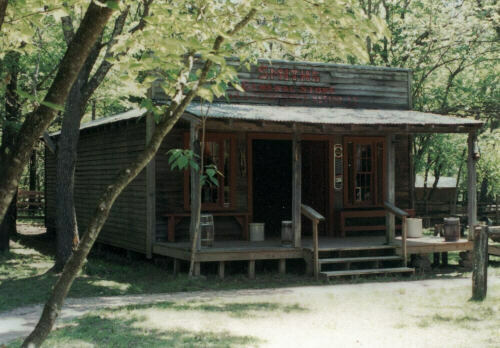 "A Cherokee General Store would carry many of the items popular across North America, but one could also expect to see Cherokee crafts which might have been bartered in exchange for products from the store, and such a store might have carried products especially desired by Cherokee craftspeople, such as beading needles and leather-working needles. A General Store was just what its name implies. It was a store that sold items of a general nature, such as food, medicine, household goods, and clothing material. A general store could special order items, such as lamps, or books, or boots. It regularly carried the most basic of things such as flour, salt, sugar, and baking powder, but also carried candy and smoking pipes. When a new load of things arrived, it could be an exciting day for shoppers. Often the general store might be operated by one person. If he was away, the store was closed. Generally, the storekeeper would also be willing to make an occasional trade, accepting a crafted item for some needed item. The store owner was also known to have some unusual items available for loan. In early times, few products were individually wrapped, but instead were kept clean by being in bins and drawers. Many items might be sold by weighing them to determine their price. Without refrigerators and freezers, the store could only handle things that would not melt or spoil. During the winter, travelers would expect to enjoy the store’s warm stove for a spell and obtain a light meal to eat. Older members of the community might stop by for a game of checkers or to while away the time in conversation. The porch of the store was an especially popular sitting area for all ages. One corner of the store was usually the post office. 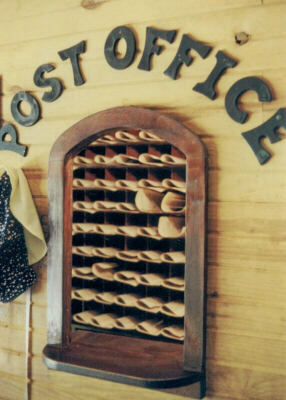 Mail delivery was irregular in the early days of Indian Territory, but eventually became standardized. The General Store of Adams Corner offers old-fashioned products and shows how important such a full-service merchandise operation was to people far from railroads and cities." "This building was originally the home of Samantha Bain Lucas, a Cherokee woman who participated in the 1889 Land Run on the Unassigned Lands in central Oklahoma. At the age of 23 years, she built this home on her claimed land. She raised two children supporting them as a rancher. Samantha died in 1941. Her granddaughter Marge Crumbaker arranged to move the simple home to Adams Corner Rural Village. Heads of household often found it necessary to build a very modest shelter due to costs and time. If their fortunes increased, they would either build a larger second house, or add onto the existing one. Meanwhile, a family could survive comfortably in a small home. 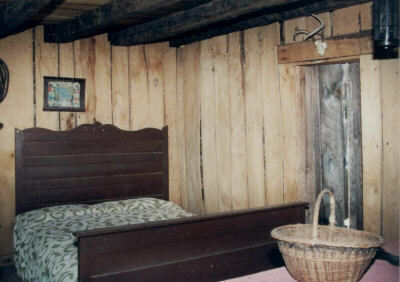 Pallets lain on the floor at night, or trundle beds slid under the main bed during the day increased bed space at night. The house attic, or loft, often became the night time abode of children, and provided storage space. Many activities occurred on the porch, so a one-room house often felt like it had more space. Furniture would be moved about as needed to accommodate various activities. Such a house required less fuel to heat. Many of our forebears were justifiably proud of their hard-won accomplishments. Most visitors admire Samantha’s Yellow House as a sensible and pretty abode exuding a strong and alluring charm." "Cherokee women were known to be fine weavers. The White Frame House is set up with a loom and a spinning wheel so that visitors may see how fabric was made for families in rural areas of the Cherokee Nation. The white board-and-batten, two-roomed house represents a transitional time in a house’s life. Board and batten construction provided a quick and relatively inexpensive way to construct a home. The batten covered the space between the board siding and often was wallpapered with newspaper in hopes of further preventing drafts. In time, walls could be studded and insulated with a wall board surface added to the interior. 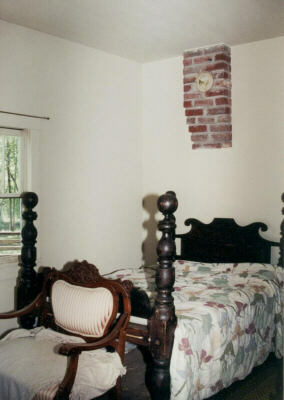 Much of a fireplace’s heat went up the chimney, and the availability of cast iron stoves proved more efficient. As cast iron cooking stoves became affordable, the owners of a house with a fireplace might choose to close up the fireplace and install a simple chimney to serve both the cooking stove and the heating stove. Not wanting to pull down the earlier chimney, and not wanting to sacrifice the old mantel that had become well-polished through use, the fireplace opening was simply shut up while the mantel and chimney were retained. Furniture could then be arranged close to what-used-to-be the fireplace. The bed did not have bed springs, but ropes were intertwined to make a surface that would adjust to pressure points. Periodically, the ropes would have to be tightened, as they would stretch with time. Houses did not have built in closets, but instead the few clothes owned by the family were kept in a piece of furniture called a wardrobe." 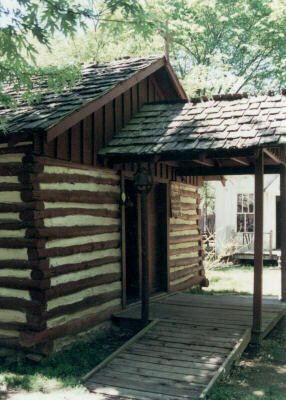 "The log cabin in Adams Corner was originally built in the Lost City area, and reportedly pre-dates the Trail of Tears." 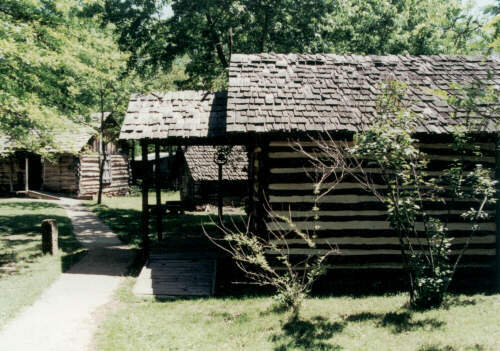 "As the early Cherokee Nation met with outside influences, starting with Spanish explorers and continuing with traders (from England, France, and Spain), various government representatives, English and American soldiers, missionaries, and American pioneers, the Cherokees adopted and adapted what they thought was useful, and rejected what was considered offensive or unnecessary. Over time, some unnecessary things would become fashionable (and thus desirable), or would become useful in a new context as the social and political environment changed. But, some citizens of the Nation were more resistant to change, and served as Tradition Bearers. 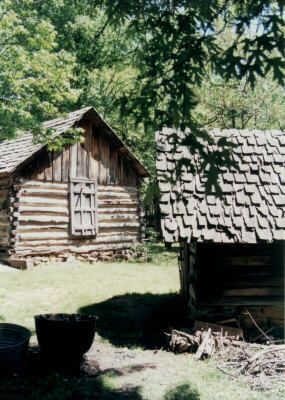 The Adams Corner Traditional Log Cabin represents the home of a 19th century family that preferred the old ways. They would have believed that a less commercial life, a more natural way of living, was superior to most modern adaptations. They would have believed that their ancestor’s ways should be honored and practiced. They sang old songs, made their own clothes following an older style, furnished their homes with crafts they continued to practice. They engaged in the ceremonial life they had been taught, and ceremonial materials might be seen in their homes. 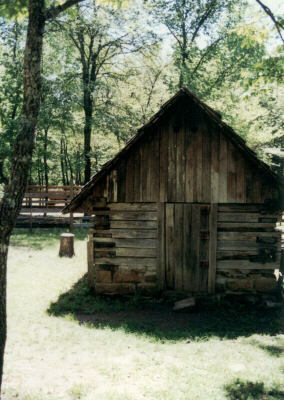 In the early days of settlement, log cabins were more common because people were moving into an area without any commerce. There were no sawmills, no general stores, no railroads to bring in materials. The cabin might have been built before there was a road. By cutting down logs for house construction, a farmer was simultaneously clearing land for crops and helping create roadways. Simple tools were all that were needed: an axe could do it all, but the added use of an adze and a saw would provide a more handsome dwelling. If the family had purchased a window and brought it with them, it would brighten their home. The walls, floors, shingles, and doors would all be wood. 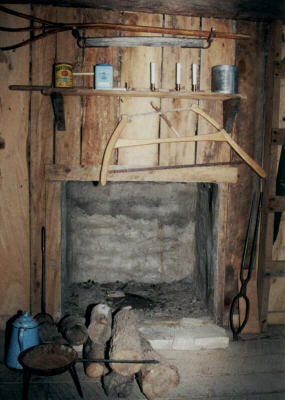 A fireplace could be built of native stone, or wood could be used if the interior of the chimney were coated with clay to prevent it from catching on fire. Chairs could be whittled and rush seats could be made. A peg on the wall became a closet, and the fireplace provided a cooking space. Mattresses were stuffed with corn shucks. In the early days, game was plentiful, along with wild fruits, nuts, and roots. According to Cherokee folklore, human illnesses started when humans became disrespectful of the animals they hunted, causing the animals to inflict the humans with sickness, but the plants took pity on humans and decided to provide medicines to relieve sickness. Many traditional Cherokee people have retained knowledge of the plant medicines which have healed and comforted countless generations of Cherokee citizens. Many of today’s modern medicines are derived from plant extracts, some of them the same plants that comforted our ancestors." "Cherokee men and women were industrious, handling their duties of family life responsibly. One duty is to make sure your family has adequate and safe food. Food preservation has always challenged people. Oxygen is the catalyst for spoilage. For plant foods, moisture also aids in decay. Early people soon discovered that dried plants could retain their flavors and nutrition if thoroughly dried, and then later reconstituted with water during cooking (dried beans, dried corn, dried squash, dried herbs, nuts, and seeds). Crackers, and thin dried breads, defy the ravages of time as long as they are kept dry. Only the thinnest of meats could be air-dried before spoiling. However, people discovered that meat packed in salt would last. The process of pickling (using vinegar) also preserves perishable foods. The use of a spring house (where cool water in the form of a spring erupts from the earth) would lengthen the freshness of food, serving as a refrigerator for milk and other perishables. Eventually it was realized that large chunks of smoked meat endured. A smokehouse was a common outbuilding on a farm a century ago. The process of smoking meats needs to be lengthy, occurring over a period of days, allowing the smoke to penetrate the meat as well as seal the surface of the meat. The process works best if a small structure is built to keep the smoke contained, and thus concentrated. The fire is kept low, directly on the ground, or in a kettle, and unseasoned wood is used to create smoke. People discovered that the meat would take on the taste of whatever wood was used, and learned that hickory provided a savory taste to meat. Before the Civil War, the process of canning was developed. By creating a vacuum seal after expelling oxygen, foods would have an extended life. Tin cans were used, but glass jars were popular for home canners because the jar could be used repeatedly as long as a new rubber seal was inserted each time. Life in the nineteenth century required much daily labor." Text shown in quotation marks throughout these pages comes from various brochures, pamphlets, information sheets, other items picked up on our visits, Cherokee Heritage Center assistance, and Internet searches. Find many sources in the links pages.